We have a pictures here of a small creosote ring. All living things try to grow and spread their population. This force that tends to spread life can be viewed as a form of inertia, so we can say that a population is either gaining or losing inertia, and sometimes we can view this inertia as a wave. Oftentimes we can see this on a grand scale. 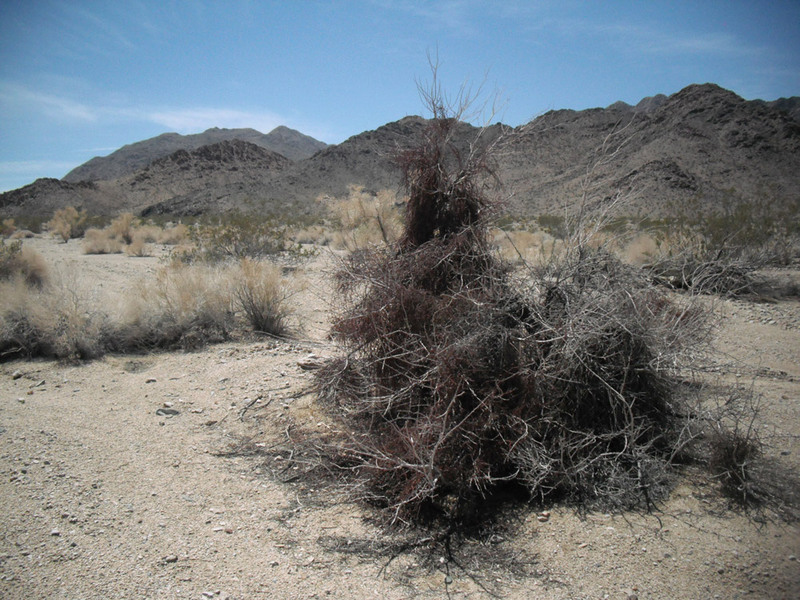 For instance the creosote bush as a species has its inertia stopped by land that is either too wet or too cold for it to grow and spread. We can also see this idea of inertia and waves on a smaller scale, the scale of the individual plant. 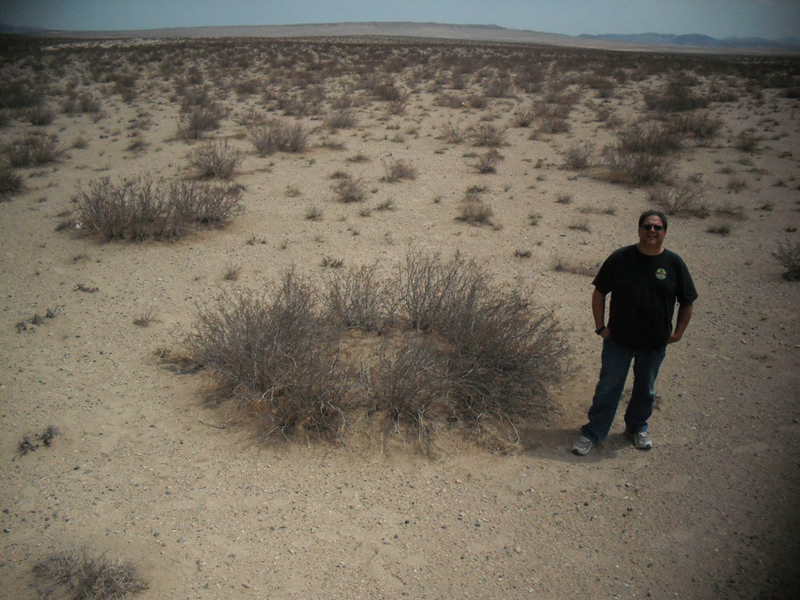 The basic process that is involved here is that the original creosote bush spread out its roots in all directions and from them sprouted other bushes, making them clones of the bush in the center. In time the center bush died and rotted away leaving a circle of creosote bushes that are all genetically the same as the original bush. 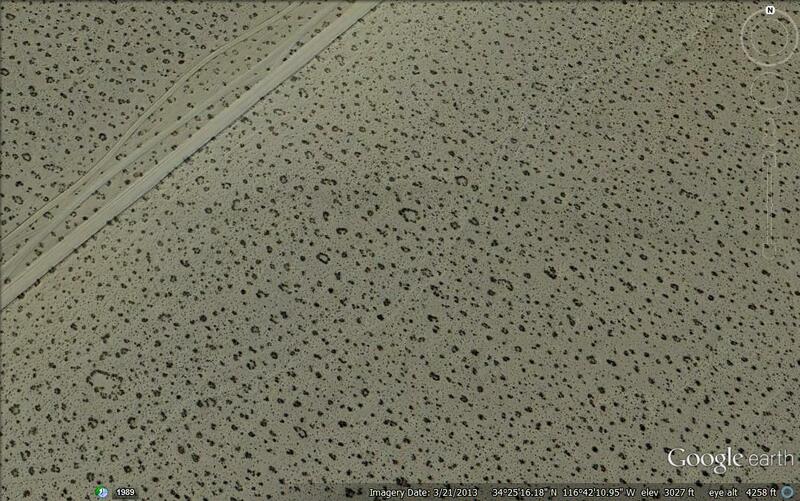 Here we have a satellite photo of the largest known creosote ring, known as King clone. While not perfectly round it is still a ring. King clone started out 10 to 12,000 years ago when a single seed fell into the sands of the Mojave desert and against great odds it sprouted. In time its life force grew out in all directions like a wave. A very slow wave but nonetheless a wave. If you ever have a chance to see it, you’ll find that the area where King clone grows is not really a good place to grow creosote bushes. There are better places where they grow faster and thicker. However life always has a special quality to it when it exists close to death. Here we see that special quality manifesting itself paradoxically as the longevity of a slow circular wave of life rippling out in all directions through the dry desert sands. To appreciate the beauty and complexity of this living form inertia, these waves of life, it is important to understand that not only do they move along the landscape but they move through each other as well, with one population rippling through the mass of the other. Sometimes they have a great affect on one another, and sometimes they have very little. While the number of these waves seem to be infinite and complex, we can examine a few of them to get an understanding on how they work. We can start with the creosote and the mistletoe. If you randomly searched 1 million creosote bushes to see if they hosted mistletoe you’d be lucky to find even one. If you know where to look you will find one, once in a while. And of course you must look where the mistletoe has the greatest population, that is greatest inertia. This is not in the creosote population but rather in the Cat claw “Acacia Greggii” population. In this picture we have a case where the inertia of the mistletoe has completely overpowered the cat claw and killed it and also killed itself in the process. This is what happens when the wave or inertia of the mistletoe and the cat claw are not in sync. When they are in sync they are truly more than the sum of their parts. When these two plants are in sync they produce a plant that not only has two types of flowers that blossom at different times, they produce two types of seeds that also ripen at different times. This has a force multiplying effect in the environment. One of these effects is the ability of the mistletoe to infest plants it normally could not. This picture of a creosote bush with mistletoe was taken about 50 yards away from the dead cat claw / mistletoe pictured above. The only creosote bushes that ever get infected by mistletoe are those that grow in an area where the mistletoe has a lot of inertia. In those rare cases where the mistletoe on a creosote sprouts, it quickly dies. I suppose the reason for this is, if things are good for the creosote it has its own life force that can fend off the mistletoe. 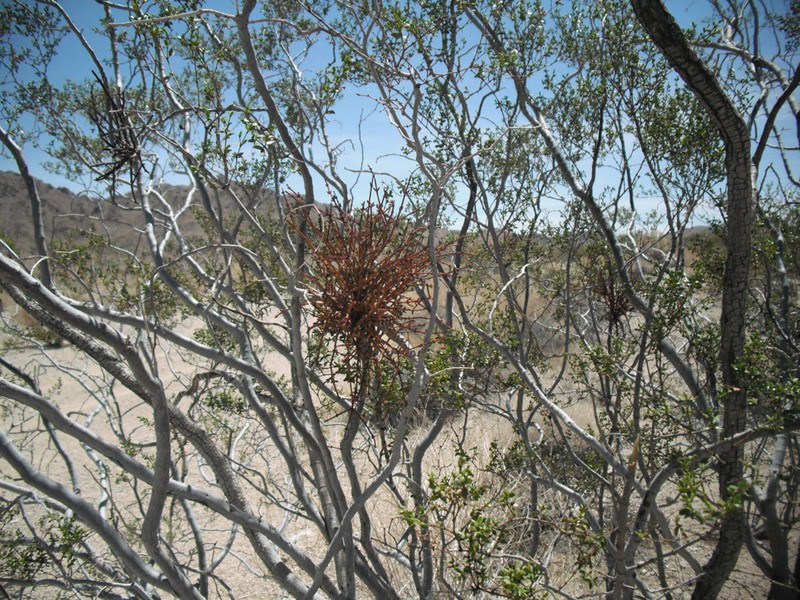 Then during dry times the creosote can survive whereas the mistletoe cannot. We can sum this up by saying it takes a lot of inertia for the mistletoe to infect the creosote but even then it does not reverberate through the entire population. Another type of wave is one that has a small effect on the host, yet is able to move across the entire species. We see this affect on creosote’s that have some curious looking balls (known as "galls") hanging on them, these galls are covered with leaves and are not a fruit or seed pod. This is an infection caused by a fly larva that lives inside them. 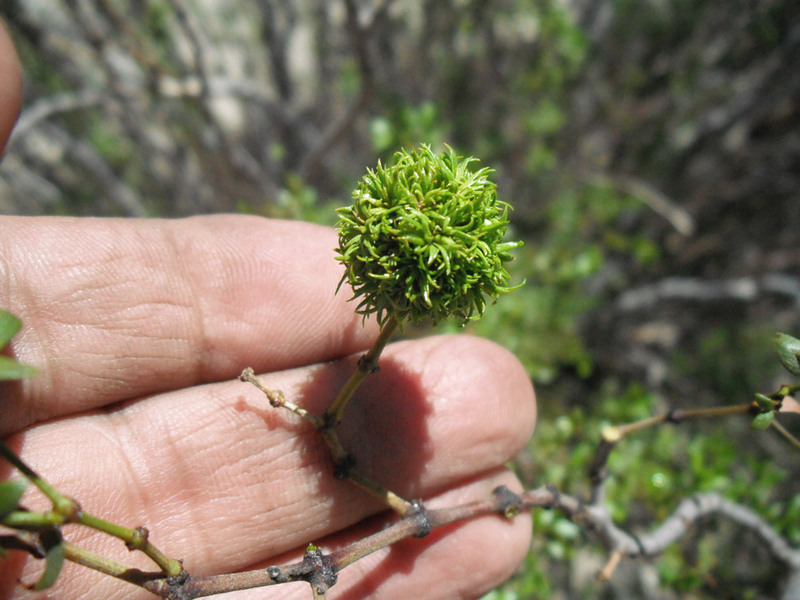 This is a picture of a creosote gall while it’s green and alive. starts with the fly laying its eggs, or larva’s in the creosote bush along with a very special fungus. Somehow the larva and this fungus change the growth instructions of the creosote bush to make this almost perfectly round gall that protects and nurtures the larva inside until they mature. These galls have little effect on the creosote but are absolutely necessary for the larva and the fly. And as for the fungus one can only speculate and wonder as to whether it is important to its lifecycle or not. So we find that in the creosote bush the life force, this inertia can take on many intricate and beautiful forms.